I am looking for this plush windup elephant that plays “It’s a Small World” for my youngest son. 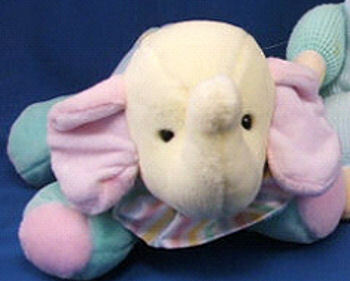 It’s an Eden pastel velour elephant with a yellow head and blue body. It has green legs and pink ears and feet. It’s wearing a striped cotton collar, and has a pastel yarn tail. My son has “Elephant” and has had him since he was born, and he loves him so much that his trunk is no longer there (from the countless hours of chewing on to be comforted), and his ear has come off from so much washing… not to mention how colorless Elephant has become from all the love he has received. I would love to find him a new elephant, so he can see what he looked like before getting so much love! Thank-you so much for anything you can do!